A native of Gainesville, Georgia, Dr. Banks earned both his undergraduate degree and Doctor of Medicine from Emory University. His post-graduate medical education includes two years of training in general surgery followed by four years of specialty training in urologic surgery. Dr. Banks completed his urology training in 1985 after serving as Chief Resident at Grady Memorial Hospital in Atlanta. Dr. Banks is fully trained in the most up-to-date urologic treatment such as Extracorporeal Shock Wave Lithotripsy and Ureteroscopy for treatment of kidney stones. 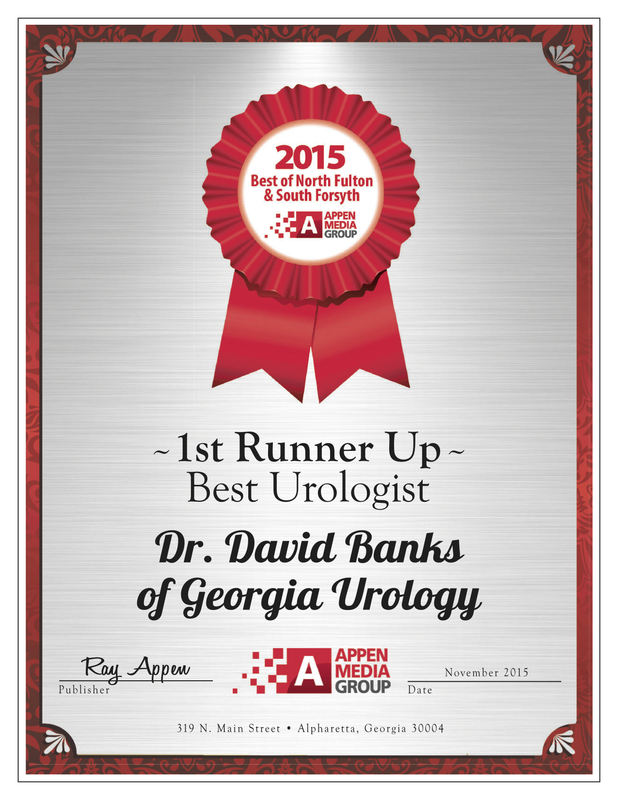 Dr. Banks is certified by the American Board of Urology and is a member of the American Urological Association. Dr. Banks has served as president of the Atlanta Urological Association and also as Chief of Staff at North Fulton Regional Hospital. He is past president of The Southern Society of Urological Surgeons, and past President of The Georgia Urological Association. I was very impressed and appreciative of the excellent care and service by Dr. Banks and his staff. Everyone was friendly, courteous and professional during my visit. I saw Dr. Banks this week! Overall very pleased with the service, he recommended I have an ultra sound of my kidneys to rule out a possible tumor. Thirty minutes later, the ultra sound and Dr. Banks evaluation was completed! Overall good news! The staff, from the receptionist to the nurse were all excellent! Would highly recommend to anyone! Dr. Banks and all the staff at Georgia Urology are Professional, Courteous, and Prompt with the appointments. Dr. Banks takes the time to answer questions and explain possible alternatives, never walks in and seems rushed. 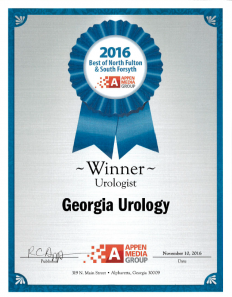 I highly recommend Dr. Banks and the staff at Georgia Urology!!! Had to make an emergency appointment with Dr. Banks and he got me in almost as soon as I arrived. Both Dr. Banks and his nurse, Rebecca, were very concerned with my treatment and explained exactly what they were doing. I have been a patient of his for over 10 years and can highly recommend him and his whole staff. I will continue to utilize him for all my urology treatments. I recently saw Dr David Banks for the first time. I was extremely please that he listened to me intently and carefully explained the next steps of my treatment. I highly recommend Dr Banks. I had been using another urologist for several years. He retired and he recommended Ga Eurology . I was fortunate to be placed into Dr Banks schedule! Very personable, knowledgeable and accommodating! Dr. Banks and the staff are quite friendly and professional. I have had several visits and had one procedure done and have been completely satisfied. He has a knack for making his patients feel at ease. Excellent doctor, staff and practice.